year. Will your team be able to help solve the mystery? Davey Crockett and Daniel Boone were amoungst the first frontiersmen to travel through Asheville in 1797. The construction of the railroad in 1880 transformed Asheville into a resort and theraputic health center. George W. Vanderbilt purchased 120,000 acres in the late 1880's on which to build the Biltmore Estate. Renowned Author Thomas Wolfe was born and raised in Asheville. 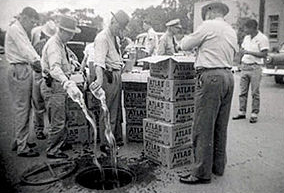 Asheville has a rich history in bootlegging and moonshine that dates back to the 1700's.